Mrs. Hamer’s physical pain did not stifle her love of God or her desire for freedom. Even as she suffered for attempting to share freedom through citizenship education, Mrs. Hamer brazenly shared the word of God with her “enemies,” simultaneously praying and acting for conversion in the face of oppression. Death was not a deterrent for this courageous prophet of freedom. Her commitment to speaking truth transcended her own suffering. Like Saint Paul before her, Mrs. Hamer preached through protest: sitting, standing, marching, shouting, conversing and singing. Standing against tyranny of unjust voting laws, segregation, and social inequality, she converted Americans by boldly demanding that the United States live up to its national vocation of human freedom and equality. 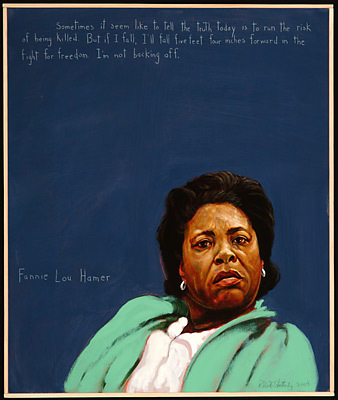 Mrs. Hamer’s perseverance through suffering helped ignite the fervor for truth that was central to the mid-and-late 20th century civil rights movements, as well as inspiration for contemporary efforts to participate in the enactment of God’s good kingdom. For Mrs. Hamer, the commitment to evangelism through social and political action was the driving force behind her courageous struggles. How does Mrs. Hamer’s life of evangelization and protest witness to Christians today? Mrs. Hamer’s story is a testament and affirmation of the Christian evangelical commission, which calls us to spread the good news to the ends of the earth, sharing the gospel of Jesus Christ with anyone who will listen, but especially those who persecute us. In our contemporary context, we often become reticent or uncomfortable with our evangelical call. We fear disrespecting the beliefs of fellow humans who either affirm another belief system or claim no explicit system of belief. We fear being persecuted for our commitment to the gospel in a society where its radical claims do not make much sense. This commission, however, is central to who we are as a Church. Like Hamer, we are called to preach the gospel even when it is inconvenient. Mrs. Hamer prompts us to speak the gospel boldly and passionately. At the same time, her story reveals the necessity of honoring those who differ from us as a testament to the truth of Christ’s good word that profoundly transforms us from hatred to love. In ecclesial and public discourse, Mrs. Hamer story calls us to listen and reach out to others across ideological differences. Exhibiting the virtues of prudence, fortitude, temperance and justice, along with the theological virtues of faith, hope, and charity, Mrs. Hamer challenges us to proclaim the gospel without bending it to our own narrow ideologies and self-interest.